Let time elapse.The most obvious technique will be to leave time before editing a draft. Your own work is the hardest to edit, of course, because you know what you are trying to say. Professional or peer editors can be guided to some extent by their own confusion. You have to devise ways of making sure that you are seeing the work from the perspective of someone unfamiliar with your project. Letting time elapse is the surest way of accomplishing this goal. When I discuss this strategy in class, students often appear highly sceptical, even amused. While they don’t usually say much, I imagine them to be thinking, ‘Sure, this sounds great and I know that I should be doing this, but I’m not and I never will, so what else you got?’. I do persevere with this pie-in-the-sky advice because it does actually become more realistic as graduate study progresses; during the thesis writing process, ‘letting time elapse’ is inevitable for even the most last-minute person. As you move ahead with later chapters, make sure you go back and work through earlier material with fresh eyes and without a looming deadline. But since we often do edit under time pressure, here are some other strategies that will work even when time is tight. Read your work aloud. Since your work will sound foreign to you as it is read aloud, this practice will help you to cultivate a different sort of awareness of your own writing. Read paragraphs out of order. This practice will help to prevent you from neglecting the writing itself in favour of focusing on the underlying ideas. Looking at paragraphs in isolation can also help focus your attention on paragraph cohesion. Stop at the end of each paragraph. By stopping at the end of each paragraph, you can confirm for yourself that you have actually edited that paragraph. Edit in stages. It is very difficult to edit with more than one problem in mind. Plan to edit your document a number of times, targeting specific issues each time. Choose a logical order, starting with the broadest issues and moving to finer issues. Do you have other ways of concentrating your mind on the editing task? Feel free to share your successful editing strategies in the comments below. From Inside Higher Ed, here is something on explaining doctoral research in general terms. It is easy to see why the PR department of a university might be interested in having doctoral students or recent graduates who can comment cogently on their work for a general audience. But I think this ability can also be great for you as a writer. In the first place, being able to give a ready account of your work will boost your confidence; it never feels good to stumble over an explanation of the project to which you have devoted your whole life. And the clarity and simplicity that you achieve when you encapsulate your research will always help you to understand it better. Also from Inside Higher Ed, here is something on procrastination. This article reviews a new book by Piers Steel, The Procrastination Equation: How to Stop Putting Things Off and Start Getting Stuff Done. I particularly liked how the article referred to Steel as a ‘procrastination expert’; I am pretty sure we all think of ourselves as procrastination experts! The point that jumped out at me in the interview with Steel was his comment on procrastination among people who are ABD: “Doing any major task for the first time is extremely hard motivationally as you don’t have a firm mental image of what you are supposed to be doing.” It’s a simple point, but still a profound one. Not being able to see the full trajectory of the project can leave us uncertain and thus prone to procrastination. 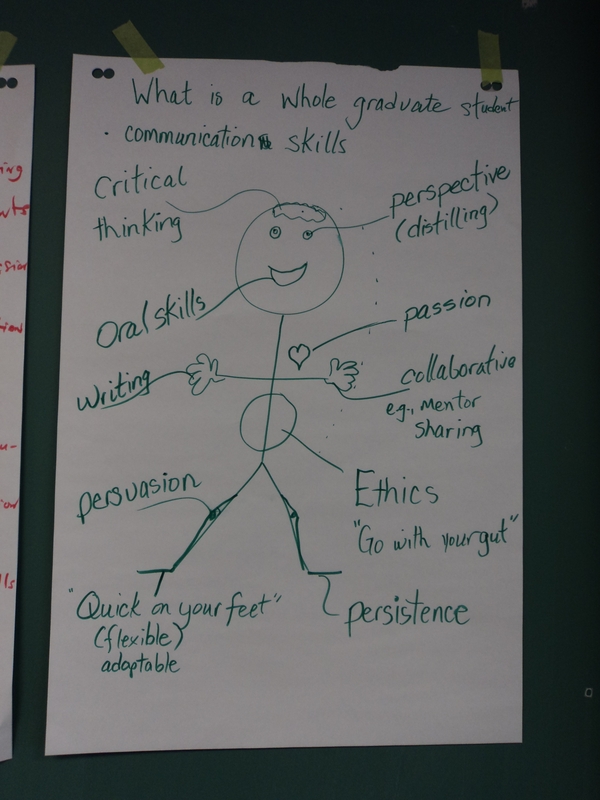 You can see a mind for critical thinking; eyes for greater perspective; a mouth for oral presentations; a heart for passionate commitment; one hand for writing and the other for collaborative work and mentoring; a gut for ethical instincts; feet for flexibility (being ‘quick on your feet’) and persistence (being ready to ‘go the distance’); and, my favourite, knees upon which to beg for funding. Thanks to all the members of our group! I wish I had learned all of their names so I could give them full credit here. This paper will consider: strategy, structure, personnel, and process. This paper will consider four areas of inquiry: strategy, structure, personnel, and process. In this case, we have a complete sentence before the colon. If we want to go on to say what those four areas of inquiry are, we need to provide that information separately. A colon allows us to indicate that what follows will provide the information necessary to complete the thought found in the first sentence. Note that what follows a colon need not be a full sentence; single words, phrases, and full sentences can all appear after a colon. This paper will consider strategy, structure, personnel, and process. This paper will consider: the nature of strategy in the high-tech industry in the period starting in 1983, the structure, both financial and organizational, of CHX Corporation, the management of personnel in this company at this time, and the process whereby the company came to occupy such a dominant market position. In this case, the colon—while still technically redundant—is definitely there for a reason. The author used a colon in response to an inkling that the reader would need to know that a list is coming. So, in this case, try keeping the colon and adding the requisite words to create a full sentence before that colon. This paper will consider four areas of inquiry: the nature of strategy in the high-tech industry in the period starting in 1983; the structure, both financial and organizational, of CHX Corporation; the management of personnel in this company at this time; and the process whereby the company came to occupy such a dominant market position. In fact, let’s look at the only rule of colon use: a colon should appear after a complete sentence. Here a colon allows us to fulfill the promise of the first sentence without belabouring the point. We don’t have to say ‘In fact, let’s look at the only rule of colon use, which is that a colon should appear only after a complete sentence.’ The version with the colon is, in my view, preferrable since it uses fewer words and avoids a commonplace pattern of subordination. If you have questions about colons or thoughts about the role they play in academic writing, please leave them in the comments below. As a graduate writing instructor, I think about thesis writing much of the time. And this week I am thinking about the topic even more than usual. I am starting a new thesis writing course this afternoon, and I am making a presentation at a conference on Friday on thesis writing as professional development. Since thesis writing is all that I’ll be thinking about anyway, I thought I would devote today’s post to the idea of using resources for thesis writing. In my presentation on Friday, I am going to discuss how a thesis writing course can be a valuable form of professional development for graduate students. Simply put, writing instruction becomes professional development when it focuses on the writer rather than on a particular piece of writing. As long as thesis writers see their goal as merely surviving the ordeal of writing a thesis, they are not likely thinking about their long-term development as academic writers. My presentation will focus on two ways that thesis instruction can encourage this sort of professional development. First, a thesis course can present the notion of thesis as genre, an approach which opens students’ minds to a new dimension to their responsibilities as writers; not only are they trying to complete a particular research task, they are also trying to convey that research in a form that is meaningful and valuable to the research community they seek to join. Second, a thesis course can also discuss the resources necessary for a student to thrive during the thesis writing process. It is this second aspect that I wish to touch on here today. When I speak about resources in the thesis course, I am doing so in order to make students aware that there are so many resources available and that they can significantly improve their own writing process by availing themselves of such resources. Too often, I encounter students whose ‘writing resource’ is their supervisor; in some cases, of course, this works well, but more often it leaves the student feeling under-supported. Thesis writers generally need to move from thinking of themselves as fully dependent on a supervisor to thinking of themselves as developing academic writers who can take advantage of a range of resources. The sort of resources I have in mind include books on thesis writing; completed theses, especially if they are linked by a shared supervisor or by similar topics, methodology, etc. ; thesis writing groups; courses on thesis writing or on academic writing more generally; published work in the student’s own field; and blogs about the thesis writing process. Such resources are plentiful (and multiplying rapidly), so I’ll mention just one today. I particularly want to recommend The Thesis Whisperer. This site presents wide-ranging advice that is both accessible and wise. Broad topics include the writing process; working with a supervisor; the oral presentation component of thesis completion; using new technologies in the writing process; productivity and other psychological aspects of the writing process; publishing considerations; and general research support. Anyone writing a thesis will find some parts of this advice, with its warm and supportive tone, helpful and relevant. It is impossible, of course, for any source of support to be universally applicable; a necessary part of using a broad range of resources is developing the ability to distinguish between advice that is appropriate for your circumstance and advice that would be better suited for someone else (for instance, someone working in a different country or someone from a different discipline or someone with a different theoretical framework). That is, even the most general advice is inevitably rooted in a particular context, and we all must learn to ‘read’ advice and support in such a way that its value for us becomes apparent. Taking advantage of an expanding range of resources is a way of improving the thesis writing process. Although we all know that we are not actually the first person ever to write a thesis, many of us instinctively approach our writing life as though we were. Figuring it out as we go along; hoping for the best; using trial and error to make key decision; treating a supervisor as the only source of support and feedback—all of these strategies tend to isolate us and keep us unnecessarily apart from the community of thesis writers. If you are writing a thesis, take stock of your current situation so that you can find the resources that will ultimately improve your life as a writer.